Following on from the tiny teaser the other day, Respawn Entertainment have released a cinematic trailer and release date for Star Wars Jedi: Fallen Order. Putting you in the shoes of Cal Kestis, a Padawan who survived the Order 66 purge (from Star Wars Episode III: Revenge of the Sith). You have to stay one step ahead of the Empire and its Inquisitors in this single-player third-person action adventure, accompanied by your faithful droid BD-1. There is going to be a heavy focus on using the lightsaber as you learn how to use Cal's force powers. When Respawn approached us with the idea for this game, we were immediately supportive. A single player, story-driven title in the Star Wars universe was exactly what we were looking for, and we know the fans have been eager for one, as well. Focusing on Cal stepping back into the shoes of a Jedi post Order 66 opens up a lot of gameplay opportunities and rich story threads to develop for this new character and his backstory. 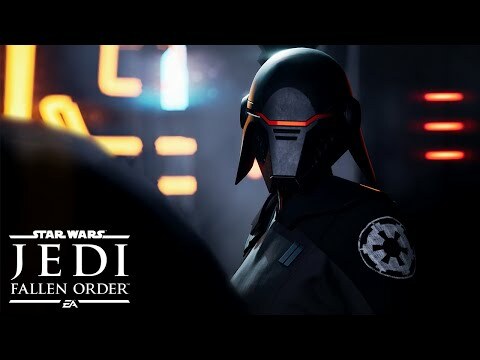 Star Wars Jedi: Fallen Order is coming to Xbox One, PlayStation 4 and Origin on PC, on 15th November 2019. Yeeeeeep this looks rad as heck, 100% down.